I am sooo freaking excited! I will be pouring as a volunteer at the San Diego Beer Week Beer Guild VIP Brewers party on Friday November 1st. The San Diego Brewers Guild is awesome. San Diego Craft Beer is awesome. This Friday, San Diego Beer Week begins with the official kickoff event, the Guild Festival VIP Brewer Takeover, at the Port Pavilion at Broadway Pier from 6 – 9 p.m. This beer list was released this afternoon. Tickets are $75 for unlimited beer and food samples, plus the commemorative glass and live music. Day-of pricing will be $100 at the door. Day two of the Guild Festival is on Saturday, with both VIP ($55) and general admission ($40) tickets available. 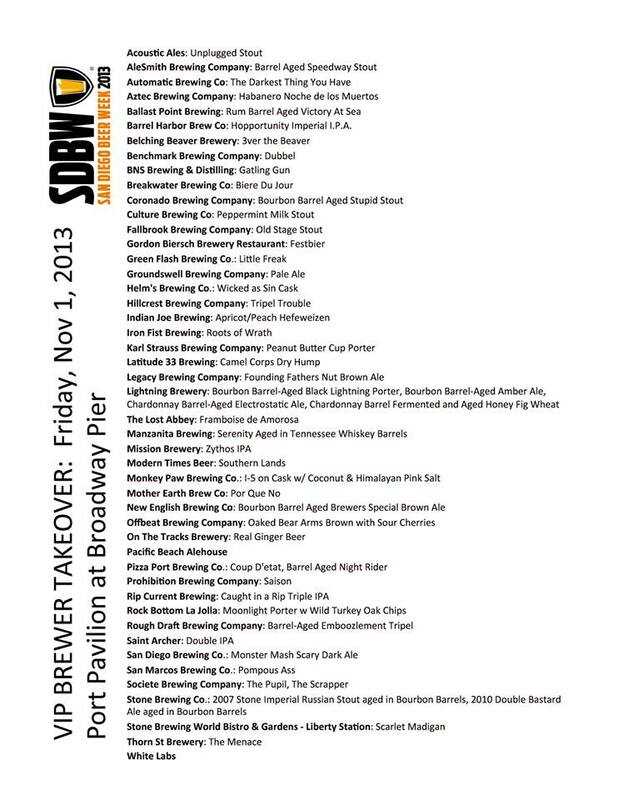 See all other SDBW events here. There are SO MANY amazing events going on its hard to choose which ones to go to! And did I mention that my lovely wife Nanelle Newbom is now the Stone on Kettner Downtown Stone Store manager? yes indeed! and they open during San Diego Beer Week. Life is good my friends, very, very good.